How Can the New Trump Tax Plan Affect Your Social Security Benefits? 2019 is setting up to be a tumultuous year for Social Security. New laws or modifications to past laws may impact your benefits and the way you make your election. Your Social Security claiming strategies can vary dramatically depending on numerous factors that the government doesn’t share directly with you. Often, you must find out the information on your own. 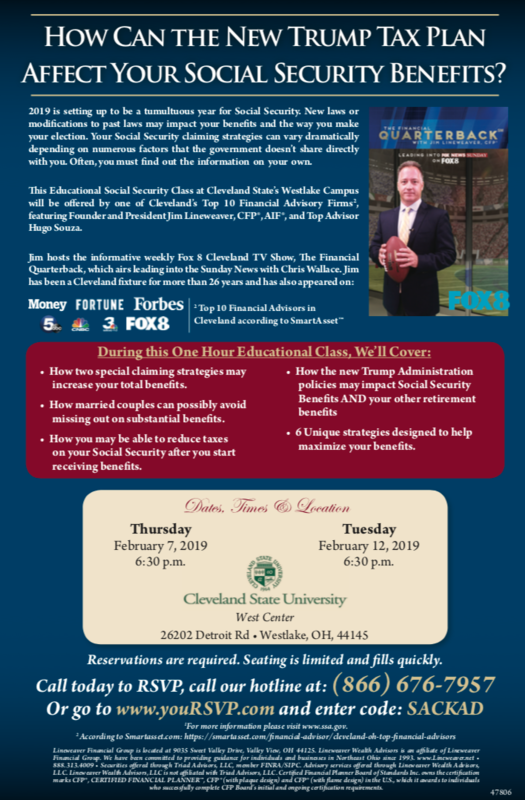 This Educational Social Security Class at Cleveland State’s Westlake Campus will be offered by one of Cleveland’s Top 10 Financial Advisory Firms2, featuring Founder and President Jim Lineweaver, CFP®, AIF®, and Top Advisor Hugo Souza. How two special claiming strategies may increase your total benefits. How married couples can possibly avoid missing out on substantial benefits. How you may be able to reduce taxes on your Social Security after you start receiving benefits. 6 Unique strategies designed to help maximize your benefits. 1For more information please visit www.ssa.gov. Lineweaver Financial Group is located at 9035 Sweet Valley Drive, Valley View, OH 44125. Lineweaver Wealth Advisors is an affiliate of Lineweaver Financial Group. We have been committed to providing guidance for individuals and businesses in Northeast Ohio since 1993. www.Lineweaver.net • 888.313.4009 • Securities offered through Triad Advisors, LLC, member FINRA/SIPC. Advisory services offered through Lineweaver Wealth Advisors, LLC. Lineweaver Wealth Advisors, LLC is not affiliated with Triad Advisors, LLC. Certified Financial Planner Board of Standards Inc. owns the certification marks CFP®, CERTIFIED FINANCIAL PLANNERTM, CFP® (with plaque design) and CFP® (with flame design) in the U.S., which it awards to individuals who successfully complete CFP Board’s initial and ongoing certification requirements.